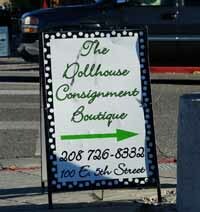 Sandwich-board signs placed away from the businesses they are advertising could prompt fines from the city of Ketchum. Business signs could be deemed entirely illegal on Ketchum's public sidewalks, but the offending and yet useful signs are set to slip through the cracks, at least for the holiday season. At issue are illegal signs set away from businesses designed to grab the attention of passersby that in some cases have also blocked pedestrian traffic or been left out overnight. Ketchum Mayor Randy Hall had asked the city to enforce compliance to current rules that allow "sandwich boards" as long as they're directly in front of the correlating business and not blocking sidewalk travel. Under the current sign rules now under review by the Ketchum Planning and Zoning Commission, a number of business owners who have been setting sandwich boards against the rules have been warned and could face fines. However, during a special P&Z meeting at City Hall Nov. 23 to continue working on new proposed sign rules, commissioners expressed hope that the city would exercise leniency with regard to enforcement and that business owners would use discretion until the latest draft for sign rules are ironed out. Commissioner Sam Williams said that in light of the fact that some business owners are currently struggling and because the city hasn't yet come up with a complete set of alternatives, it should exercise restraint with regard to enforcement of the standing rules. The proposed rules currently being edited can be read at the city's website, www.ketchumidaho.org. Place the mouse over "City Departments," then "Community and Economic Development" and click on "Sign Code Amendments." A public hearing on a final draft will be scheduled at a future date. "We're all trying to work hard to find solutions that are acceptable," Commissioner Michael Doty said, seemingly in an effort to be diplomatic as business owners look for guidance through the holidays. "I think the message would be ... don't take advantage. Be cognizant of where you put it. Take it down at night." Ketchum Planning Manager Stefanie Leif said at the meeting that Mayor Randy Hall had asked that enforcement be ramped up and that a grace period for removing non-conforming signs had ended Nov. 15. "That really is where we are concentrating attention right now ... off-site signs," Leif said, adding that the enforcement issue is separate from the ordinance the commission is discussing. However, she said she would raise the issue with the mayor to see if something could be negotiated with business owners to get everyone through the holidays. Most at the meeting said the city is in a transition period and the next slack season would be a better time to iron out enforcement since the rules should be clarified by then.